Join us tomorrow on the Twitter chat! Tomorrow, Monday, March 24th at 1pm CDT (time zone conversion), we're going to have Get Your Fix #boutofbooks chat. Come see what other book lovers are reading! Come watch @BookBender end up in Twitter jail! 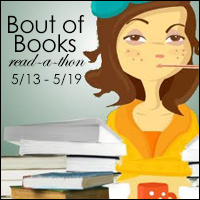 Join us for all the #boutofbooks fun you can handle! Tomorrow! March 24th! 1pm CDT (time zone conversion)! Don't forget the Get Your Fix Bout of Books chat! This is your friendly reminder that you can get your Bout of Books fill in ONE week on March 24th. In one week, on Monday, March 24th at 1pm CDT (time zone conversion), we're going to have Get Your Fix #boutofbooks chat. What will we be doing, you ask? You LIKE chatting about bookish topics, right? So join us on March 24th. Need a Bout of Books fix before May? Get your Bout of Books fill on March 24th. On Monday, March 24th at 1pm CDT (time zone conversion), we're going to have Get Your Fix #boutofbooks chat.